Soil anchors the plant and provides some nutrients to the plant. Plant prepares major nutrients from sunlight, air and water vapour. Plant roots take water in the form of water vapour. Soil composition and Soil structure are the factors to be considered. 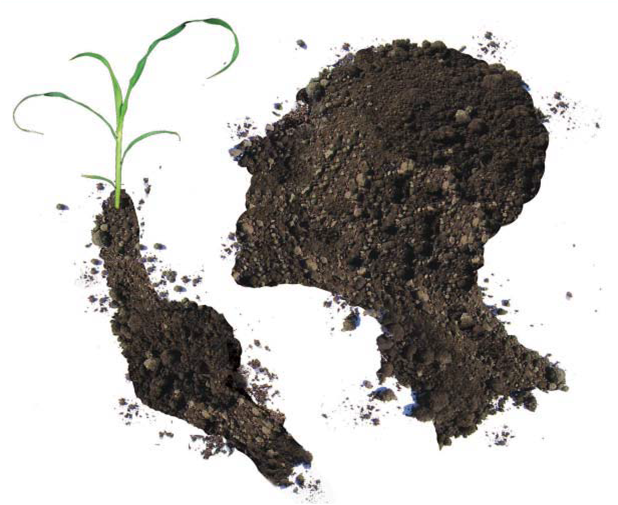 Soil composition means particles of sand, silt, clay and organic matter. The best soil composition is humus. Soil structure means particles arrangement and their packing. Favorable soil structure for farming is that having the porosity, water holding capacity. Humus is having the properties of porosity and water holding capacity. Humus is simply degraded organic matter. It is formed by degradation of plants, microbes, animals. And also from the byproducts of microbes, excreta of earthworms, secretions and excreta of creatures like frogs, ants, and snails, termites, rats etc. The biota which includes microbes, earthworms, frogs, snails, ants, rats etc is responsible for maintaining humus. The spreading roots of the plant will occupy in the top layer of the soil ( Generally 10 inches from the soil surface) Plant will get some nutrients from this part. So it is essential to see that this top 10 inches layer must be occupied with humus. A.Natural method: (Happening in forests). That is not to disturb the biota so that they can do their activities. And byproducts of the biota will contribute to the formation of humus. It is the procedure happening in forests or in places where human activities not interfering with nature activates. We are getting fruits and herbs from the forest without irrigating them or without giving them fertilizers because of the natural activates of biota in the forest. This method involves simulation of those conditions prevailing in the forest. In Natural farming cow dung (Any Indigenous cow of India, which belongs to Bos indicus) in the form of Jeevamrutam is used for humus creation. Application of jeevamrutam will be followed by mulching. Mulching facilitates retaining moisture of the soil, facilitates microbial degradation of organic matter, facilitates movement of earthworms. This results in the creation of humus. Mulching can be done by dry grass, dried leaves, soil and in some cases with small plants. Some farmers may use goat, fish, poultry waste, etc to create humus. It is better than chemical farming but not superior to Jevamrutam. Some farmers may use panchagavyam for creating humus. The panchagavyam application is an ancient method in India. It is superior. But not advised at present situation. In those days cow ghee means Desi cow ghee which is produced from the butter prepared by churning curd. Now the availability of such a cow ghee is a question. It is expensive even if it is available. For jevaamrutam, anyone can get cow dung from a local cow. Need not grow a cow for this purpose. Just there needs 10 Kg cow dung/ per acre for every 15 days. This much quantity of dung simply can be borrowed in any village (In case if Desi cow maintenance is a problem).